Ellie just arrived at our shelter Easter weekend. She is a young Great Pyrenees pup. 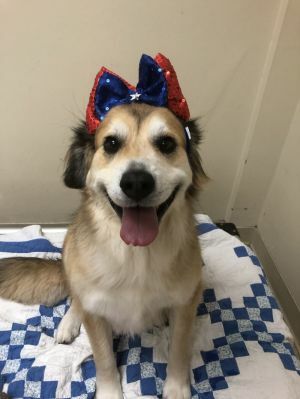 Her family realized she is going to get too big for their other dog, so she needs a home with plenty of room to grow and play. She's a happy girl and very adventurous. She requires at least a 4 foot fence. Ellie is 6 months old now. Her current weight is 65 pounds. She will probably be 85-90 lbs when full grown. The minimum donation for Ellie is $475.00. This includes all of her vetting. 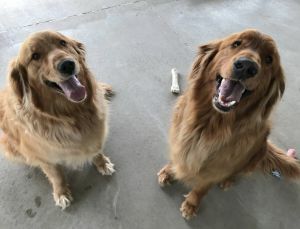 Max (dark golden) and Cody (light golden) are new to Dirkâs! They were raised to be hunting dogs and spent the first 2 and a half years of their lives outside. They are transitioning to being inside dogs and learning the ropes. They are roamers and do require at least a 4 foot fence. They are a bonded pair and need to go together. They are 3 years old as of May. The minimum donation for Max & Cody will be $500.00 each. This includes all of their vetting. Linc (brown and white) and his brother Fitz(white) have come to Dirkâs after running around as strays. 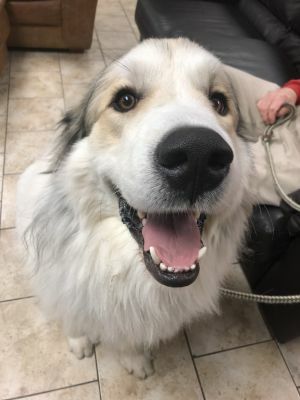 We believe they are Great Pyrenees mixes. They are very personable and are getting use to the shelter life as Dirkâs dogs. Linc and his brother Fitz are a bonded pair and will need to be adopted together. Linc requires at least a 4 foot fence. Linc is estimated to be around 2-3 years old. The minimum donation for Linc is $450.00. This includes all of his vetting. 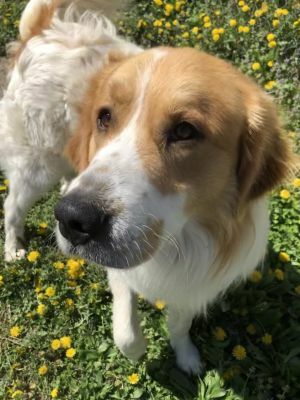 Lilo is a young Great Pyrenees with some Golden Retriever maybe too. She is on the look out for an active family with lots of energy. She is housebroken, crate trained and seems to know some commands. She has been around other dogs but likes to be the alpha and can be selective of her canine friends. It might be best that she is the only dog in her home. It's unknown how she is around kids or cats. She will require a minimum of a 4 foot fence. Lilo is a year old. Her current weight is around 90 pounds. The minimum donation for Lilo is $475.00. This includes all of her vetting. 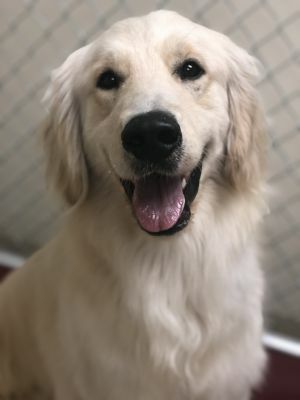 Zeus is a very handsome young Golden Retriever or possibly an English Creme. He has come to Dirks after being left at animal control for what the owner indicated was self-asserting toy possession. He has had some professional training and would only benefit from more of this. We will not adopt him to a home with any children of any age. He should go to a home with an experienced dog handler to continue to work with behavioral issues. Zeus does require at least a 4 foot fence. Zeus is around 2 years old. His current weight is around 65 pounds. The minimum donation for Zeus is $475.00. This includes all of his vetting. 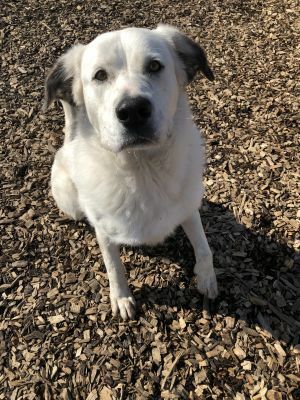 Stella is a beautiful, friendly Great Pyrenees mix. She came to us after having a litter of puppies. She is a sweet natured girl just looking for her forever home. She is playful and likes some other dogs. She would great in your home! Stella requires at least a 5 foot fence. Stella is around 3 years old. Her current weight is around 80 pounds. The minimum donation for Stella is $400.00. This includes all of her vetting. 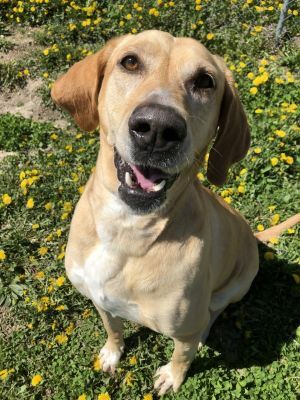 Daisy Mae is a yellow lab mix. She has come to Dirk's after her owner suffered a stroke and was put into a nursing home. While in her previous home she would care for the feral cats and give them baths. She does this sometimes with her stuffed toys too! She loves people and will easily roll over for a belly rub. She doesn't do well around other dogs and needs to be the only dog in the family. She needs to work on her training. Daisy Mae requires at least a 4 foot fence. Daisy Mae is around 5 years old. Her current weight is 90 pounds. The minimum adoption fee for Daisy Mae is $400.00. This includes all of her vetting. 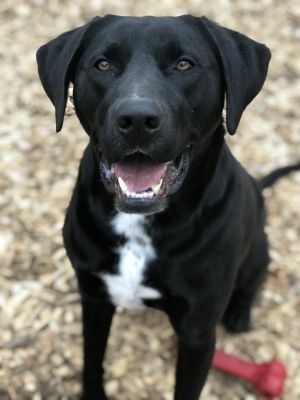 Dexter is a young lab mix. He has come to Dirk's due to his family's allergies. He has lots of energy but knows his boundaries. He has had some training and does well on a leash. He would great in a home with older children who love to play and possibly with a canine friend. Dexter requires at least a 4 foot fence. Dexter is a year old. His current weight is around 70 pounds. 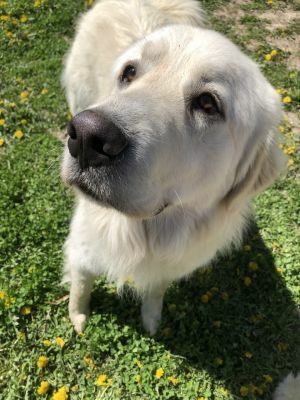 The minimum adoption fee for Dexter is $400.00. This includes all of his vetting.